Pro-Troop Charity Misleads Donors While Lining Political Consultants' Pockets - The National Memo - Smart. Sharp. Funny. Fearless. The charity later described the fundraising drive as a rousing success: In less than five weeks, all 800 Marines in a 1st Marine Division battalion nicknamed “Geronimo” were sent care packages and notes in Afghanistan, it claimed. Russo didn’t respond to questions from ProPublica. Danny Gonzalez, a spokesman for Move America Forward, did not answer questions either, instead providing a four-paragraph defense of the charity. “We are proud of the fact that we always appropriate our donor’s [sic] funds ethically and in the spirit of our mission to support the troops,” he said, adding that Move America Forward was currently preparing 2,000 boxes of care packages for shipping. Move America Forward raises much of its money with its annual fundraiser, called Troopathon, held this year at the Ronald Reagan Presidential Library and broadcast live on the Internet. Over the years, Troopathons have featured live and taped appearances by conservative stars from entertainment, media and politics, including actor Gary Sinise, rock idol Gene Simmons of KISS, Sarah Palin, Rick Perry, Rush Limbaugh and Sean Hannity. The charity counts all the money raised in the month of the broadcast as part of Troopathon. Much of the rest came from responses to the emailed appeals it sends out every day or two, emotional notes packed with exclamation points and capital letters. The emails often seize on a tragedy like the Boston bombing and then ask for help sending boxes filled with items like Jelly Belly jellybeans, Swiss Miss hot chocolate and Hoo-Ahhs field towels. Each package for an individual servicemember is paid for with a $24.99 donation, the charity says, but it’s unclear what the $24.99 pays for. The items in each care package are donated, a former consultant who spoke on condition of anonymity said, and volunteers put them together. “Our volunteers pack each box to the brim,” the charity’s outreach coordinator Scott Raab told a radio show over Memorial Day weekend. ProPublica traced other photographs employed in fundraising pleas by Move America Forward to media outlets such as Agence France Press, Reuters and the San Antonio Express-News, to photos posted by servicemembers on Flickr, to random photos pinned on Pinterest. Move America Forward even used the photograph of a soldier hugging a woman found on Pinterest for a Valentine’s Day pitch, digitally removing the soldier’s name, Boyer, from his cap. “You’re Never Going to Believe What This Double Amputee Marine Did!” announced the subject line of an email sent Dec. 11. The message outlined the heroics of Larry Draughn, a former Marine who lost his legs in a roadside bomb in Afghanistan but managed to help rescue stranded motorists during a snowstorm in Ohio. But the Department of Defense, which oversees Walter Reed and the VA hospital system, doesn’t endorse — or partner with — charitable organizations. If a charity wants to be listed as a community resource on the Defense Department-managed website, OurMilitary.mil, it has to meet certain criteria, including being nonpartisan and being favorably vetted by at least two charity evaluators, such as Charity Navigator. Meagan Lutz, a spokeswoman for VA hospitals, said the VA system hadn’t officially worked with Move America Forward. “I’m hearing all negatives — we haven’t worked with this organization and many haven’t heard of it,” Lutz said. 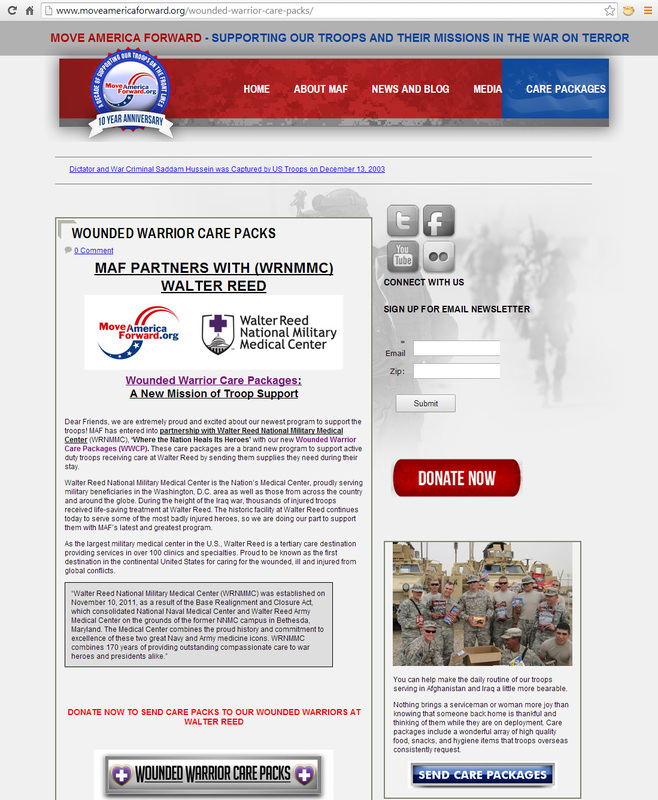 At the end of 2013, the charity claimed in an email to have sent “thousands of bags full of necessary items to troops at military hospitals.” Move America Forward still advertises Wounded Warrior Care Packs for VA hospitals and Walter Reed, filled with things like grippy hospital socks, a dental kit, snacks, a notebook, a pen and playing cards. In May, one button on the charity’s website sent donors to the website of a company that processes credit-card donations called DonationSafe, founded by Callahan. Move Forward America doesn’t reveal how much it pays DonationSafe to process donations, but the company has received substantial fees for similar work for Russo-affiliated PACs. The Conservative Campaign Committee, then known as the Campaign to Defeat Barack Obama, paid DonationSafe almost $267,000 for credit card processing in the 2012 election cycle, when the PAC brought in $3.9 million. Eustis, the former Tea Party Express consultant, said Russo and others “basically used the Move America Forward email list to start online fundraising,” back in 2008, when the charity list had about 50,000 names and the Tea Party Express was just starting. “It’s definitely intermingled,” he said. Flanked by American flags, co-host Melanie Morgan, Move America Forward’s co-founder and board chairwoman, begged viewers to donate money. She said the charity wanted to send care packages to every servicemember in Afghanistan and Iraq, adding that the charity tried to keep its costs “very low” to maximize the resources going to service members. Dwindling resources in Afghanistan had left some troops hungry, making Move America Forward’s work more urgent than ever, she said. A charity can’t support a candidate? Sounds like a free-speech problem to me. Looking forward to the Supreme Court ruling that says so. Everybody knows money is speech. You know, like contributing to the mayor’s campaign to solve a zoning problem. What’s the big deal? Oh come on man ,,it’s no big deal. Remember when Tom Delay went around the floor of congress handing out envelopes stuffed with money just minutes before they Took a vote on regulating big tobacco. They’re not even really *trying* to hide. I guess they consider themselves too big to fail. This is a travesty! Using our troops to solicit money whether to line their own pockets or to help their super pac, these people should be put in jail. I don’t blame Gary Sinese as he was just a pawn in their scheme. Put these A**holes in jail. This is not a Democrat or Republican scheme but rather a bunch of lowlife scum. I was in the marines and believe me one of the last thing the military would cut is food for their troops. As long as there are troops on the ground the military will support them. It isn’t a band of brothers for nothing. Enforcement agencies never, NEVER issue summaries of that kind. They may report that they found no evidence of actionable violation, or something of that sort, but they do not issue endorsements based upon assumptions that their examination was universal. On a second matter which has been bugging me for some time now, when the hell did an individual soldier become a “troop”? I hear that lately from many news sources. I thought “troop” referred to a body, a group, and individuals were soldiers. I know it is not vital, just bugs me. I think the “troop” thing began about the same time that a pair of pants became a “pant” I always feel when they advertise a sale on pant, that It will only have one leg. Then you would have to buy a right pant and left pant seperately, and hope they match, or at least look good together. Funny that. In recent years I have also noticed a vast expansion in the use of the word “hero”. I’m old I know, but when I was coming up the hero was the person who risked his/her life to enter the burning building to save another. Now it is used to describe anyone who copes with an unfortunate occurrence, whether or not any valor was exercised. I also don’t view being highly paid to hit, catch or throw a ball qualifies as heroic behavior, but the word gets applied there too. Should read “Scamathon.” …The old tip-off was the admin. % costs which in some cases ran well in excess of forty even fifty percent….Why not call it a fraud and be done with it? What are the chances the teapublicans will investigate this scam but based on their past performances the only things they are interested in is repealing the ACA, Benghazi, taking away women’s health rights, tax cuts for the rich, destroying the middle class, cutting social welfare programs and suing President Obama. Seems the only time they care about the men and women serving our country is when they need them to fight another war. Where’s Issa when you need him???? Oh. That’s right. This makes republicans looks more slimy than ever. So he won’t touch this one. Just when you think you couldn’t possibly be more disgusted by the tea party, they stoop to a new low.